From Left: Mr. Oliver Profitt –Coordinator (ag), Ministerial Task Force TIP; Mr. Troy Torrington –Director of the Multilateral & Global Affairs Department, Ministry of Foreign Affairs; Ms. Alexandra King Pile –Chief of Political & Economic Affairs, United States Embassy, Guyana; and Ms. Lucresha Bryan-French –Foreign Service Officer III, Ministry of Foreign Affairs. The Ministerial Task Force on Trafficking in Persons has engaged Foreign Service Officers from the Ministry of Foreign Affairs in a One-Day Training Programme on Trafficking in Persons (TIP) at the Guyana Police Force Officers’ Training Centre. The main objective of the training was to equip Foreign Service Officers with the necessary skills to effectively respond to Trafficking in Persons in their line of duty. This was one of the recommendations identified for Guyana, in the United States Department of State’s 2017 Trafficking in Persons Report “the need to provide training for diplomatic personnel on trafficking”. 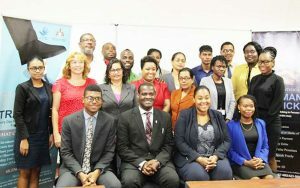 The Training also allowed participants to understand the nature of inter-agency collaboration in the fight against trafficking in persons in Guyana, the available local and international support with regard to repatriation and resettlement of victims, and the legal climate surrounding TIP in Guyana. The Task Force Members who facilitated the presentations were all recipients of prior TIP Training from INTERPOL, IOM and the US State Department. Over the past twenty months, the Task Force with the support of its member agencies has been conducting a series of training courses for various stakeholders and will continue to do likewise to combat the crime of TIP. The training was held on Monday.